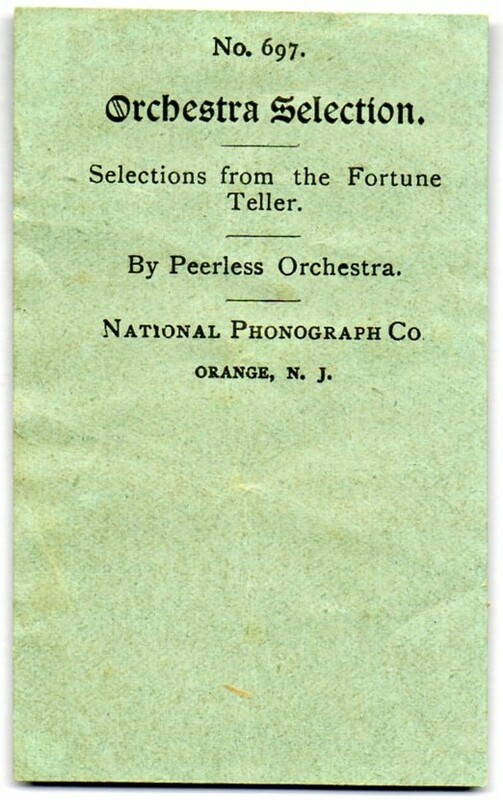 From 1899, the Peerless Orchestra performs Selections from The Fortune Teller featuring the famous Gypsy Love Song. Announcement "Selections from the opera The Fortune Teller, played by the Peerless Orchestra. Edison record." 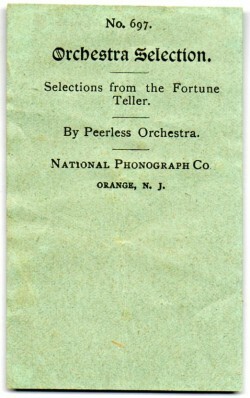 This fine recording by the Peerless Orchestra features an early recording of the chorus to "Gypsy Love Song" (0:54-1:58). Although frequently revived and performed in a popular up-tempo fashion by such personalities as Bing Crosby, Connee Boswell, and Chico Marx ("The Cocoanuts", 1929), it was originally known, as you will hear, in its melancholy almost lachrymose rendering. The Fortune Teller, a 3 act operetta, was created in 1898 by the prolific team of composer Victor Herbert and writer Harry B. Smith. Original (Edison) National Phonograph Company record slip. See the sheet music for "Gypsy Love Song" (also spelled "Gipsy"), courtesy of the Lester S. Levy Collection of Sheet Music. Up-tempo form by Connee Boswell (1937). Read biographical information on Victor Herbert, courtesy of Public Domain Music, and Harry B. Smith, courtesy of Wikipedia.